Are you about to choose a topic for your dissertation? Or, are you searching for ideas for that paper that finalized your doctoral degree? You now can search online for many dissertations — some are available to download for free with the new demand for Electronic Theses and Dissertations, or ETDs. In other cases, you can gain access to abstracts or titles through libraries and colleges or universities. The following list of the top 30 Web tools to search, download and review dissertations online can help you with that search. In most cases, dissertations written after 1977 can be found at one resource — ProQuest. This resource is listed below as well as many other resources that hold dissertations written both before and after that date on a wide variety of topics. You also can do a search for “ETD + school name” to find digital dissertations for any given school, if they exist. DART: DART-Europe is a partnership of research libraries and library consortia who are working together to improve global access to European research theses and link to full text theses. Dissertation.com: Dissertation.com allows free, full-text access to the first twenty-five pages of each item. EThOS: This Web site indexes UK dissertations and provides links to full text where available and provide assistance to institutions digitizing dissertations. If available, full text dissertations are free to download. Google Scholar: Use this search engine to find older dissertations, books and other scholarly works that may be accessed in full text or abstract. Microsoft Academic Search: Explore over 6,316,811 publications in a variety of topics through this new site. Networked Digital Library of Theses and Dissertations: NDLTD provides access to citations from thousands of digital dissertations and theses that are in PDF format. A significant number of these resources are freely available in full-text and can be viewed online. OpenThesis: This is a free repository of theses, dissertations, and other academic documents, coupled with powerful search, organization, and collaboration tools. Theses Canada Portal: Full text electronic versions of Canadian theses and dissertations are available in PDF format for those theses published from the beginning of 1998 to August 31, 2002. American Studies Association Doctoral Dissertations Abstracts: These dissertation abstracts are submitted to the American Studies Association by American Studies graduate programs and by recent American studies Ph.D.s. Database of African Theses and Dissertations: Register to gain access to the DATAD database, which contains citations and abstracts for theses and dissertations completed in African universities. Dissertation Abstracts Online: This search is a definitive subject, title, and author guide to virtually every American dissertation accepted at an accredited institution since 1861. Abstracts are included for doctoral records from July 1980 (Dissertation Abstracts International, Volume 41, Number 1) to the present. PhdData: This site is the product of the combined initiative and efforts of several doctorate students in the U.S.A., Argentina and Israel, who felt the need for one site that would concentrate all existing information on doctoral researches around the world. Thesis Abstract and Dissertation Abstracts: This site provides a library service which allows anyone who has written a thesis, dissertation or paper to publish their abstract and make it available to the Internet community. In some cases, you may need to contact your institution or library to gain access to these databases or to specific papers. 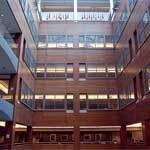 Center for Research Libraries: Twenty thousand doctoral dissertations from outside of the United States and Canada are searchable from this site. No full text is available online, but items can be ordered through inter-library loan by students, faculty, and staff. NCSU Libraries Theses & Dissertations: The North Carolina State University uses a search option that allows users to find dissertations stored online at that university as well as at other libraries. Must have an NCSU library pass, a local library pass, or you can use guest access in some cases. OCLC WorldCat Dissertations and Theses: This database provides fast and convenient access to the dissertations and theses available in OCLC member libraries. Many of these are available electronically, at no charge, directly from the publishing institution. OhioLINK Electronic Theses and Dissertations Center: This site contains theses and dissertations from PhDs throughout the Ohio college and university systems. This site also provides a worldwide ETD index search. 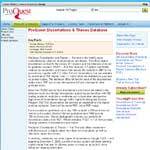 ProQuest: Log in through your library or institution to gain access to dissertations at this site. Most colleges and universities, after 1977, now file ETDs at this source. The Library of Congress: This is the only institution in the country to purchase microform or electronic versions of all doctoral dissertations filmed by University Microfilms, which means most U.S. dissertations. Directory of History Dissertations: This directory contains 26,233 dissertations that were completed or are currently in progress at 199 academic departments in Canada and the U.S.
Doctoral Dissertations in Musicology: This is an international database of citations for dissertations in musicology that contains over 12,000 records. Dissertations range from approximately 1950 to the present. 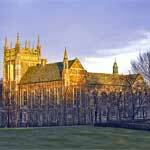 DukeSpace: Duke University offers ETDs free to download as PDF documents at this site, where you can search by title, author and subject at DukeSpace, part of DSpace, another resource that holds more dissertations from other colleges and universities. Emory Electronic Theses and Dissertations (ETD) Repository: This ETD project is a joint initiative launched by the Emory University Libraries, the Emory Graduate School and Emory College. Linguist List Dissertation Abstracts: These pages are designed to provide information about the dissertation abstracts in the LINGUIST List database. MARS: George Mason University’s “Mason Archival Repository Service” offers a wide variety of dissertations free to download. NJIT Electronic Theses & Dissertations Project: More than 1,300 theses and dissertations are available to download as ETDs at New Jerey’s Science and Technology University. 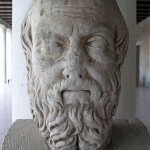 Socrates: Stanford’s online Web catalog, Socrates, is the primary finding tool for identifying Stanford dissertations. The Special Collections Department keeps a repository copy of Stanford dissertations in the University Archives. University of Georgia Electronic Theses and Dissertations: Since the fall semester of 2001, all theses and dissertations at this university are required to be electronic and are searchable through this database. University of Illinois Dissertations and Theses: This site contains the collections for dissertations and theses produced at the University of Illinois at Urbana-Champaign. Virginia Tech ETDs @ VT: Search for citations and abstracts of thousands of theses and dissertations. Free full-text access is provided for a substantial percentage of these items.